Rear of house in 1968. The Maddox House in the Tuxedo Park neighborhood stands as a shining example of the work of one of Atlanta's most beloved architects, Phillip Trammel Shutze. Constructed in 1937, the Maddox house came to accompany other large estates in the rolling hills near West Paces Ferry Road, in Atlanta's Tuxedo Park neighborhood. Constructed in the style of Classical revival, the Maddox house shares more likeness to its surrounding estates in landscaping than architectural style, but all share in the quality of being designed by some of the most prominent names of the time, including: Hentz, Reid and Alder, Pringle and Smith, Walter T. Downing and Phillip Trammel Shutze. As of January 2016, the current owner of the Maddox house had announced plans to demolish the structure in favor of new construction. 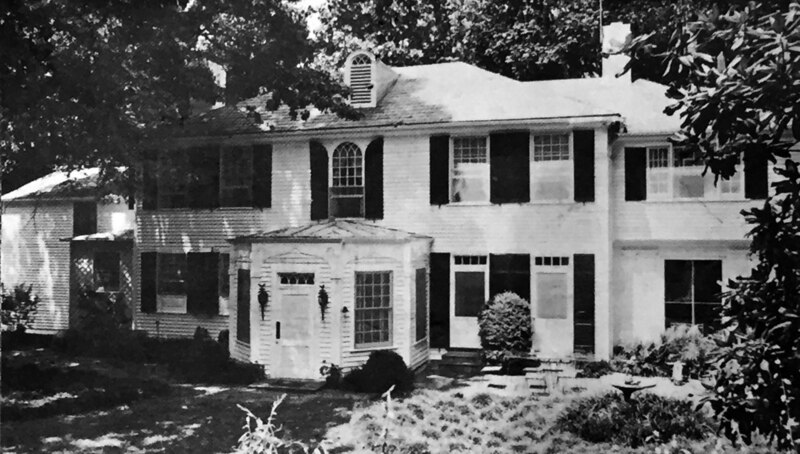 The Atlanta Preservation Center is actively advocating for the Maddox house to be preserved due to being an example of the work of Phillip Trammell Shutze and also the formation of an historic in town neighborhood. The Atlanta Preservation Center recommends an addition to the existing home for more space, rather than demolition. More information about the Maddox House and its recent develpoment can be found here. Update: As of February 1st, plans were announced by the owner to demolish the Maddox House on February 3rd, 2016. The Atlanta Preservation Center is actively monitoring the situation and continues to urge for the preservation of the home.